Steve and Jamie Sidells are a retired couple who have a small family. They are bi-coastal in that family members live on both the East and West coasts of the US. Steve manages the family nest egg with input from a select group of advisors. The Sidells worked hard for many years to build their wealth. They want it to sustain them through their retirement years and to be a source of support to their daughter and grandchildren. They want their wealth to provide for a good education for their grandchildren and possibly to help them start their careers. As the Sidells began to look at their future, they decided it was important to build relationships with advisors who could succeed them and provide continuity of service to their heirs. They were looking for people of good character and capability who they could trust to act in their interests. This is why they chose Casey Neilon. The Sidells had worked for many years with William Crandall, who merged his practice with Casey Neilon. Mr. Crandall provided excellent service and tax strategies for the Sidells which helped them mitigate taxes and retain a greater share of their wealth. 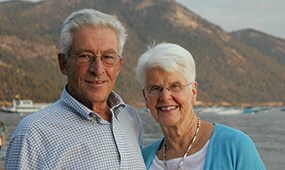 After sailing around the world for a few years and enjoying their retirement, the Sidells began to seriously consider their future and how their wealth could be best applied to the goals they’d set for their family. They began to realize that they needed a trusted family advisor who could deeply understand their needs and take action on their behalf. “We were looking for the right professionals,” states Mr. Sidells. “We needed longer-term financial planning and an estate plan that aligned with our wishes.” The Sidells’ strategy was to look for younger professionals they could trust including an estate attorney, a financial advisor and an accountant. They were hoping the accountant would be local and could serve as the quarterback for the advisory team. But what really mattered to them is that all of these advisors would act together, as one team, to serve the Sidells and their heirs. “I wanted to get people in the same room so they could form real relationships with us and our loved ones. I wanted the relationships to be personal and familiar,” says Mr. Sidells. The Sidells asked Darsi Casey, Managing Shareholder of Casey Neilon, to take the lead on financial oversight of their affairs, their accounts and their estate plan. Casey Neilon also provides annual tax consulting and tax preparation services for the Sidells family. The Sidells have greater peace of mind today because Casey Neilon is serving them, representing their interests and watching over their affairs. The Sidells have been committed to choosing younger professionals of good character and excellent skill who can serve their family.